So, the new living room furniture is here! The orange goes great with the rest of the house. It actually inspired me to change my original color scheme. Instead of red being the color that goes through the three main rooms, I'm going to use orange. The living room and kitchen have orange in them already, I'm simply swapping out the red in the dining room for a deep orange. Originally, I was going to add red to the living room curtains and pillows, but I really wanted to get away from the red and orange scheme and get into some more vibrant, fun colors. I chose orange, teal blue, and kiwi green with a few marigold accents to pick up on the color variations of the orange furniture. I was actually able to find the perfect fabrics at Ikea. The only color they didn't have was the teal, but I was able to find teal sheets that I cut up instead. I used these fabrics to make pillows and curtains. It's been awhile since the last time I sewed anything, so I grabbed a couple packs of No-Sew fabric adhesive and Velcro so I could easily remove the pillow covers to be washed. I was up until 1:30am making the pillow cases. The first few I did I used the adhesive. I didn't like the way those turned out; the tape is about 1/2" thick which leaves you with a 1/2" border around the inside edges of the pillow and gives you a flat, floppy look. In the end, I sucked it up and got out my needle and thread. Though I'm not a super sewer by any means, the pillows look nice and are fluffier than the glued pillows. The curtains still need a little work. I didn't like the original design so I got up at 6:30a this morning and added loops to the top to give them a little more updated look. I used the marigold cotton fabric for the curtains but I think I'm going to add a little of the orange loose-weave fabric to give the curtains a little more texture. Tonight, I'm going to pick up this great Danish coffee table which will go perfectly with our furniture. The previous owners redid the top in a hunter green but I think I'm going to go with the kiwi or teal for the living room. After the Thanksgiving trip to Ohio, I'll be purchasing the record cabinet finally. I found a couple on craigslist that have beautiful wood and are still in working condition! 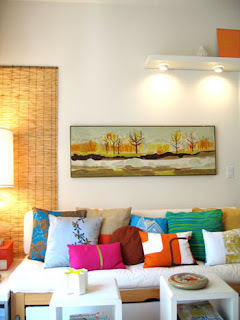 My computer's having issues uploading my pictures :( so instead of living room pics, I'll leave you with some awesome 60's inspiration from Apartment Therapy.